As a test of fast thinking answers to questions, Split Second has no equal. Each player takes it in turns to ask the questions and spins the dial to choose a category. Once the question has been asked, the other players write their answers in double-quick time before loading them into the paddles that propel them into the centre of the board. The fastest correct answer gains a valuable point until the winner reaches a pre-determined total. 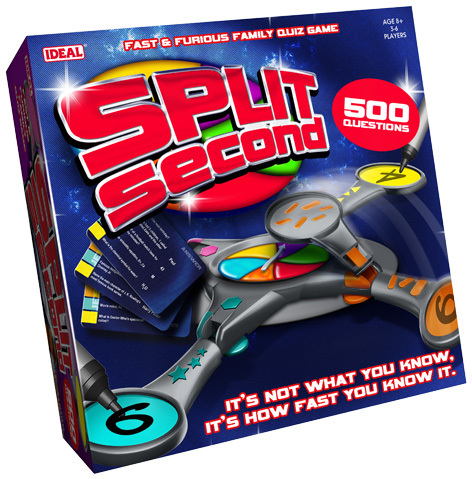 Three to five players can join in to play Split Second at once, with the questions being suitable for kids aged 8 and over. Sold by master games maker John Adams, this fast action game joins a popular collection of favourites including Rubik's Void and Dragon Chase. Please tell us what you think of Split Second by John Adams.